Legion d'Honneur medal Edward wearing his medals. To celebrate the 70th anniversary of the D Day landings, the French Government decided to award the Legion d'Honneur to all soldiers still living who participated in the landings. camp near Trottisclife and also trained at Barmouth North Wales. As a lieutenant he embarked from Portsmouth for the D Day landings in 1944. He was driving a Jeep and was first off the landing craft. The beach was difficult to negotiate due to large concrete barriers. Edward decided it would be easier to turn the Jeep round and reverse up the beach. They set off on the prescribed road and stopped by a sheltering hedge and had a picnic. A rather surreal thing to do, but troops need to eat! The road was littered with debris including telegraph poles and wires, the latter getting entangled round the wheels and immobilising the vehicle. Fortunately they came across some soldiers with wire cutters, but in his enthusiasm to release the Jeep, he cut through the brake pipes! At the end of the war Edward was awarded Knight of the Order of Orange Nassau medal, along with campaign medals, one of which has a leaf to denote, “Mentioned in Despatches”. 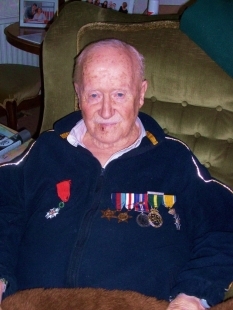 Edward, now aged 92, was not fit enough to attend a presentation ceremony by the French Ambassador, so his medal was posted to him.